The silver jewels from Rachel Art Jewelry, designed by Rachel Eshkol, are made from 925 silver and set with semi-precious stones and pearls. The design of these jewels is inspired by ethnic motifs from both East and West, as well as by the textures and other wonders of nature. 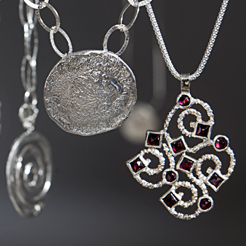 The unique techniques used in processing the raw material provide the finished jewelry with a special look that is at once interesting, rich and original. Settings including semi-precious stones and pearls add to the attractiveness of the silver jewelry with a variety of shades, forms and textures.